LANSING — A representative who may run for the Senate and two candidates who could square off in one of Michigan’s most competitive House districts are receiving heavy support from political donors, according to new campaign finance disclosures. 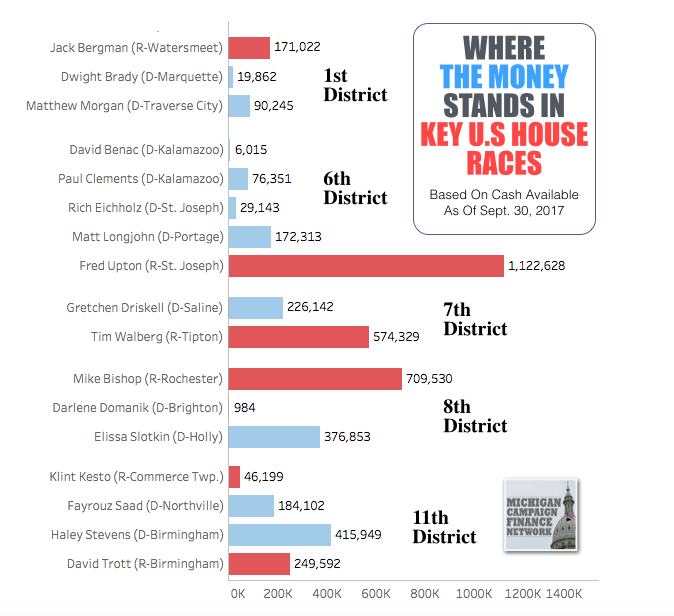 While the November 2018 election is still more than a year away, current U.S. House members from Michigan and candidates for their seats combined to raise about $4 million over the last three months. A wide majority of that money has been flowing to just four of Michigan’s 14 congressional districts. Candidates and current officeholders in the 6th, 7th, 8th and 11th districts reported raising about $2.7 million in the last fundraising quarter (more details on each district are available below). Those districts are expected to be among the most competitive in Michigan in 2018, and the money is already showing that. 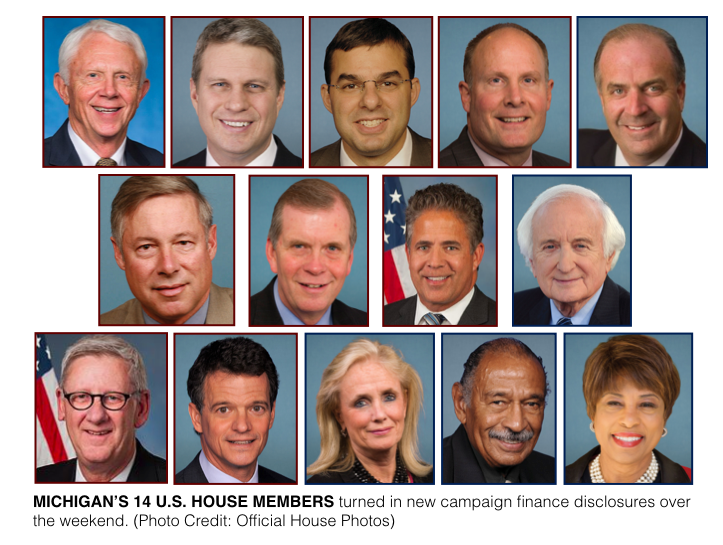 On Sunday, candidates for the U.S. House in 2018 had to file their quarterly campaign finance disclosures. The reports covered fundraising that took place from July 1 through Sept. 30. The top fundraiser among Michigan’s incumbent U.S. House members and announced candidates was Rep. Fred Upton, a Republican from St. Joseph. Upton reported raising $526,627 for the quarter, an average of $5,787 a day. 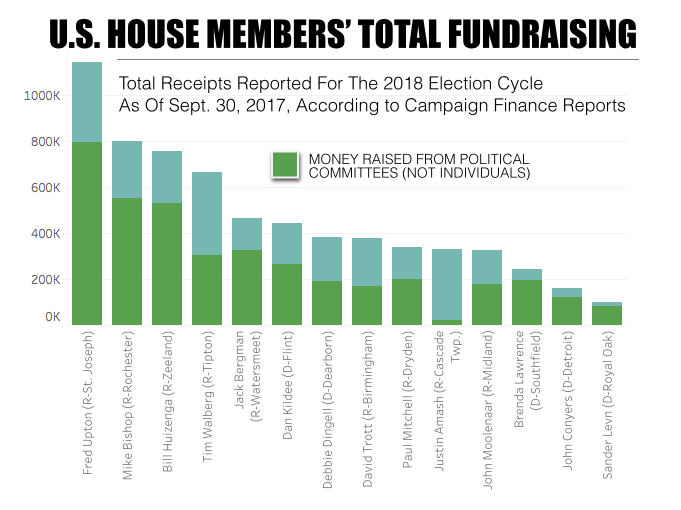 Michigan’s other top fundraisers were two candidates in the 8th Congressional District: Elissa Slotkin, a Democrat from Holly; and Rep. Mike Bishop, a Republican from Rochester. Slotkin, who hopes to unseat Bishop, reported raising $460,939 over the last three months while Bishop reported raising $366,306. But they were both well behind Upton, who was first elected to the U.S. House in 1986. He is said to be considering a campaign for the U.S. Senate in 2018. Sen. Debbie Stabenow, a Democrat from Lansing, currently holds the seat. Upton represents the 6th District in southwest Michigan. As of Sept. 30, he reported having $1.1 million available in his campaign account. The majority of the $526,627 he raised last quarter came from political action committees (PACs), which gave his campaign $395,750. Among his donors were the Quicken Loans PAC and the National Beer Wholesalers Association, which each gave Upton $10,000. A spreadsheet that shows important figures from the new reports of Michigan's U.S. House members and 2018 candidates is available at this link. The spreadsheet includes totals on fundraising and spending and information on some of the top donors. In addition to Upton’s large fundraising haul, four Democratic candidates also reported raising money in Southwest Michigan’s 6th District between July 1 and Sept 30. Matt Longjohn, a physician from Portage, reported raising the most among the Democrats at $212,866. Paul Clements, a professor from Kalamazoo who challenged Upton in 2014 and 2016, reported raising $91,719. Rich Eichholz, a businessman from St. Joseph, reported raising $73,665, and David Benac, a professor from Kalamazoo, reported raising $8,049. Another Democratic candidate, George Franklin, of Glenn, officially launched his campaign after the previous fundraising period was over. The top fundraiser last quarter among challengers to Michigan’s incumbent U.S. House members was Slotkin, who was assistant secretary of defense for international security affairs under former President Barack Obama. She’s running in the 8th District, which has been represented by Bishop since 2014. Slotkin reported raising $460,939 over the last three months. Only $17,500 of that total came from PACs, according to her reports. Her campaign still had $376,853 available as of Sept. 30. Bishop raised $366,306 during the quarter. Since the last election, he’s raised $798,424 with $709,529 available on Sept. 30. Another Democratic candidate, Darlene Domanik, an environmental lawyer from Brighton, reported raising $697 last quarter. Since she launched her campaign, Domanik has raised $14,877. The 8th District features Ingham County, Livingston County and a portion of Oakland County. The Oakland County-based 11th District is open in 2018 because Rep. David Trott, a Republican from Birmingham, decided not to seek re-election. Two Democrats have been aggressively raising money in the 11th. Fayrouz Saad, who worked within the U.S. Department of Homeland Security under former President Obama, raised $250,576 over the last reporting quarter, her first quarter in the race. Haley Stevens, who was chief of staff on the Auto Task Force inside of the U.S. Treasury Department under former President Obama, reported raising $201,225 for the quarter. Since launching her campaign, Stevens has raised a total of $524,265. Trott raised $20,900 during the quarter. He reported having $249,591 available at the end of the quarter. Trott could use the money to help other Republican candidates and causes for the 2018 election or he could refund donors. Numerous Republicans are said to be considering running for Trott’s seat. One of the candidates, state Rep. Klint Kesto, a Republican from Commerce Twp., launched a fundraising committee on Sept. 15 and had already raised $46,199 by the end of the month. The 2016 race between U.S. Rep. Tim Walberg, a Republican from Tipton, and former state Rep. Gretchen Driskell, a Democrat from Saline, cost about $5.8 million. Walberg won, but a re-match is expected in 2018. Both candidates were active fundraisers last quarter. Walberg reported raising $252,070 from July 1 through Sept. 30. Over that same period, Driskell reported raising $226,112. Walberg had $574,328 available at the end of the quarter. Driskell had $226,142 available.